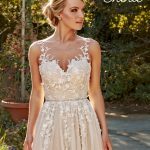 A modern update to the boho style, this Tulle and 3D floral lace wedding gown from Aime Couture is perfect for a beach wedding! Soft, flowy, and light, this Lace and tulle sheath gown is both casual and elegant. 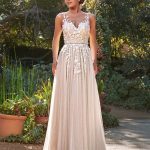 Featuring a sweetheart neckline, elegant lace bodice and straps of this gown flow perfectly into a deep back, and feature architectural beading. The tulle skirt is lightweight and voluminous and flows elegantly into the train.